As a school, we will be focusing on kindness during the next few weeks. 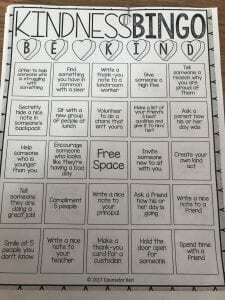 Today your child will be bringing home a “Kindness Bingo” sheet. 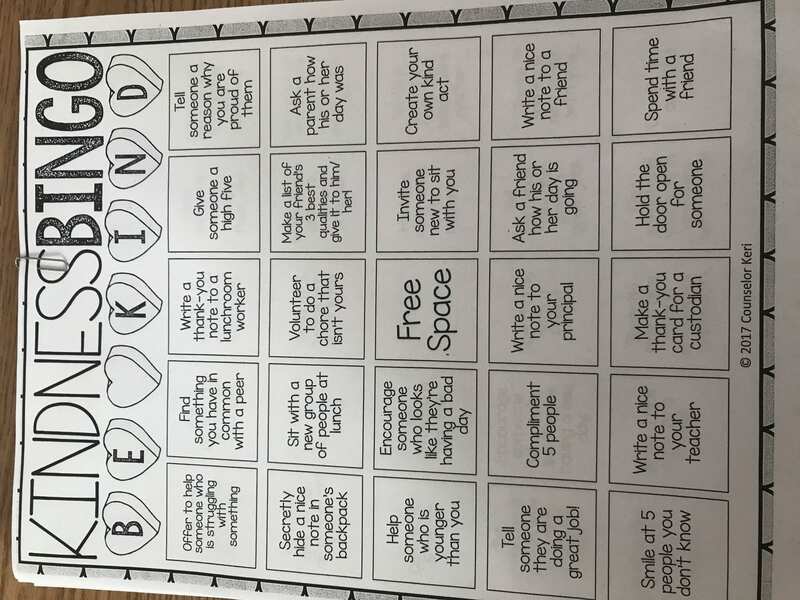 It has activities for your child to do that promotes kindness. As your child marks off a row/column in order (5 in a row), they can bring it back to school for a prize. The limit is 2 prizes per child; so they can fill in 2 rows and receive a prize Let me know if you have any questions! We will be taking a field trip to the Dearborn Henry Ford Centennial Library on Tuesday, April 23rd. The Dearborn Police will help us cross the main streets as we walk to the library! This field trip is free. Let me know if you have any questions! Literacy Night will be held at our school on Thursday, March 6th, from 5-6:30 PM. Come join us for a night filled with fun literacy activities for you and your family! As a class, we will be visiting the Book Fair on Monday, March 4, 2019. If your child would like to purchase something from the Book Fair, please send money with your child on March 4th, as that is the ONLY time our whole class can go and that I can help your child pick out a book. Thanks! STEAM Night is Thursday, February 7th from 5:00 – 7:00 p.m. It is an excellent night to enjoy many science and engineering activities. Ms. McCormick puts so much work into this night. Please come and enjoy it. There will be a PTA Bake Sale during the festivities and PTA is asking for donations of either store bought or homemade baked good to sell for the event. They can be dropped off Thursday morning in the office. Thank you in advance! We will be having a class celebration on Thursday, February 14th. Students will be able to share Valentine’s if they wish! We have 17 students in our class, but please send extras! We ask you not to address Valentines “to” specific students; it’s just too tricky at this age to hand out. Instead, just have your child write their name in the FROM section. Students can also bring a treat to share with the class during our celebration. Our class LOVES healthy snacks, so those would be much appreciated. Please let me know if you would like to send something in so I can plan accordingly. Attached you will find the Kindergarten Sight Words. Kindergarten and Young Fives are continuing to work on these sight words. We expect your child to be able read and write these words. Start by practicing reading and writing the words in the first box where it says: “First Start Here” with your child. Once they can read and write the words in each box in the first column, then continue at the top of the second column and last continue to the top of the third column. Practice the words in groups of three or four as they are listed. The order we have chosen will help your child to progress as a reader and a writer. We appreciate your support. Since today was an Ice Day, I am sending this week’s spelling list to you on Dojo and on the class blog. I will send home a printed copy this week. Please practice these words with your child tonight. These words have been on our word wall and the kids are very familiar with them. We will practice them repeatedly Thursday and Friday. For this first spelling test, due to this crazy week we’ve had, I will test the kids first thing Monday morning. I will send next week’s list home on Mondayand the test will be on Friday. Typically, the list will go home on Friday and the test will be the following Friday. I hope you enjoyed your day off! This Wednesday is Halloween. The kids will be allowed to wear costumes that day as long as there are NO REAL or PLASTIC WEAPONS, NO MAKEUP that covers their face, and No masks can be worn until the parade at 2:00. In my room, kids can bring a candy treat to pass out (each treat must be individually wrapped). If you would like to send in a snack for the kids to eat after the parade, we have 16 kids. Parents can watch the parade, it will be on the track in the rear of the school (4th and 5th grade playground). The parade starts at 2. Usually lower elementary walks the track and upper elementary students watch, then they switch and lower ele will sit and the upper ele will watch. After the parade we will go back to our room and enjoy a mini treat party. Please let me know if you would like to send in a snack for after the parade so I can plan accordingly. If you have any questions that I have not answered, please feel free to message me. Also, if you do not want your child to participate in any of the activities, please let me know.